MH17 Final report is Not a Final Report; It’s Just a Limited Hangout: It tells as much of the truth as it has to. But no more. “Limited hangout” is spy jargon for a partial admission of the truth to attempt to control the exposure of a clandestine operation. The hope is that the partial truth will satisfy the questioners and they will look no further. The phrase came into popular awareness during the Watergate scandal in 1973 as the cover story unravelled. The Dutch Safety Board report on the MH17 disaster is an example. It’s a partial statement: something very important is left out; but it is not completely left out because there may be a later need for “reconsideration”. The sources and abbreviations I use are below. The “black boxes” will tell us where MH17 was when it was hit, what direction it was going in, what speed it was travelling. The report deals with 1 satisfactorily, there is a question about 4 but it is in its answer to numbers 2 and 3 that we see the limited hangout. The report was delivered by its Chairman, Tjibbe Joustra, [quondam the Netherlands’ National Antiterrorism Coordinator – is that significant? You decide, Dear Reader – and Chairman of the DSB since February 2011] who stated that it was not the DSB’s job to assign blame. The DSB’s conclusion was that MH17 was brought down by the explosion of 9N314M warhead as carried on 9M38 series Buk surface-to-air missile (SAM) (DSBT-9); other scenarios were considered, analysed and excluded. It offers an area from which it believes the missile was launched. The Flight Data Recorder (both “black boxes” were in good shape) showed MH17 flying at 33,000 ft heading 115° at 293 kts (542kph). The recording stopped at 13.20:03 UTC at 48.12715N 38.52630538E (DSBT-47). I begin with my principal conclusion that the DSB report is a “limited hangout”. By ignoring the damage to the port wing and port engine, the Board was able to shift the approach route of the missile away from Kiev-held territory south of MH17’s route to rebel-held territory in the south-east. The Dutch Safety Board did not take into account the damage to the port wing and the port engine (see below). While it did provide a photo of the damaged port engine intake ring at DSBT-50, there is no other discussion of damage to the engine and I believe that the inclusion of the photo provides the DSB with an “out” should there be a need for a later “reconsideration” of the evidence. To summarise (see below): the DSB established a point at which the detonation occurred; the DSB understood the blast pattern of the warhead (DSBT-130 but see a better representation at AA2-35). But it ignored the fact that the existence of damage to the port wing and port engine proves that the missile had to have come from the side of MH17 and not from in front of it. That is the key point: everything up to that point in the analysis of the destruction of MH17 (leaving aside the rather small number of “bow-ties” – see below) is closely reasoned. The sleight of hand occurs when the wing and engine are forgotten. Concentrating only on the damage to the cockpit allows the path of the missile to be twisted from the south to the south-west as is required by the “rebels did it theory”. A launch point from the south rules that possibility out. This is illustrated at AA2-21. Both Almaz-Antey reports calculated the firing point as being near Zaroshchenskoye while the DSB calculates it as being near Snezhnoye. AA2-21 shows a damage comparison: a Buk fired from Zaroshchenskoye damages the port wing and port engine, a Buk fired from Snezhnoye does not. The damage to the cockpit is similar in each scenario. Because the damage to the port wing and port engine was ignored by the DSB report, they were able to make the approach line of the missile closer to the direction MH17 was heading, which allowed them to calculate the launch point so as to include rebel-held territory. Had they included the port wing and port engine damage, they would have been forced to accept a launch point farther south into Kiev-held territory. In short, they told as much truth as they could without compromising the required answer. A “limited hangout” indeed. But there are some other – less significant, to be sure – points that should be considered. The first point worthy of attention is the radar data or, rather, its absence. We are told that “The Ukrainian civil primary radar stations in the area were not functioning at the time of the crash due to scheduled maintenance. The military primary radar stations were also not operational. The Ukrainian Ministry of Defence stated that this system was not operational, because there were no Ukrainian military aircraft in the sector through which flight MH17 flew” (DSBT-38). NATO had an AWACS aircraft in the air but that said MH17 was out of its range (DSBT-44). Thus only limited radar information was available from Ukraine and nothing from NATO. This is not believable. Ignoring the “scheduled maintenance” stuff, the Ukrainian Ministry of Defence statement that there were no military aircraft in the area is contradicted when DSBT-185 informs us that Kiev claimed that a military aircraft was fired at in the Donetsk area on that very day. That is less than 40 kms away from MH17. As to NATO, it is absurd to think that NATO had an AWACS aircraft up that was not looking at the fighting area. The DSB accepts these statements without comment. Russia also provided limited radar information because, it said, as the crash occurred outside of Russian territory, it did not record the primary data (DSBT-42). The report spends some time chiding Russia for this. Another of the points that I made in my RI piece was the change in the flight path as recorded in the FlightAware website. No mention whatsoever is made of that in the DSB report. I did notice, however, that the flight plan as shown at DSBT-212 shows a slight turn to the left at the Germany-Poland border and a slight turn to the right at the Kazakhstan-Turkmenistan border. If we remove this slight deviation, we have a straight line flight path that goes over the Sea of Azov as the earlier routes did before they were changed on FlightAware. I still believe that this is a point that has been insufficiently discussed and I remind readers of the screen shots taken of the FlightAware tracks showing previous routes well south of the track taken that day by MH17 shown here and here. I remember noticing the change at the time and thinking that the flight path of 17 July was the first question that had to be answered. Again, the DSB makes no mention of any other routes taken by this daily flight. As to the fighter plane story the flat statement is made that there are no aircraft shown on the Ukrainian radar tracks except MH17 and two other commercial flights (DSBT-114). No mention whatsoever is made of the Russian presentation (MoD 9th illustration) that showed a fighter plane close to MH17. (But note the careful statement that there is nothing on the Ukrainian radar tracks. Perhaps the DSB is leaving space for a later “reconsideration”.) 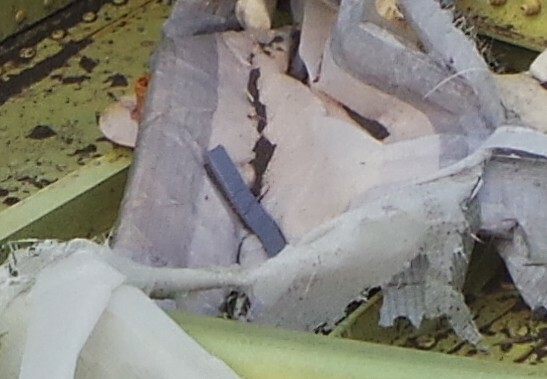 The report rules out cannon fire because 1) there are too many holes in the fuselage for a limited number of cannon rounds; 2) the presence of “bow-tie” fragments (see below); 3) there were no military aircraft in the area (DSBT-126). It returns to the issue at DSB-131 where it argues that all penetrations of MH17 came from a single point. Personally I do not find this very convincing and I do not believe that the presence of a fighter as well as a SAM is excluded, although it is clear that the SAM was sufficient to bring the plane down and kill the cockpit crew. But the DSB ought to have said something about the Russian statement that there was a fighter plane nearby. And certainly there are many holes in the wreckage that look as if they may be caused by cannon fire. And then there are the numerous claimed eyewitness statements of fighters in the area. All this should have been discussed and, if rejected, rejected with serious arguments and evidence. We now come to an analysis of the reconstructed aircraft. Or – and this is a point of great significance – the partly reconstructed aircraft. DSBV gives a good view of the reconstruction at 22:44. We see that the cockpit and part of the lower forward passenger section is all that has been constructed. Missing are the port wing and port engine. This is the key to the limited hangout. DSBT-55 begins a long section detailing what parts were recovered and from where they were recovered. Everything is accounted for except – an important exception – missile parts consistent with an Buk 9M38 missile (DSBT-80). No location is given for them and there is no chain of custody given. Are these the parts reported to have been found only as late as August 2015? We are merely informed they were found “in the wreckage area”. Photographs appear at DSBT-82. A long section analyses the sounds from the Cockpit Voice Recorder and establishes a source outside the the upper port side of the cockpit (DSBT-112) This is assumed to be the location of the centre of the explosion. This location is verified by analysing the holes (DSBT-124). All this is perfectly convincing. About 75 fragments were found in the human remains. Some of these are argued to have come from outside through the aircraft skin; some photos at DSBT-89. Two of these (three?) are claimed to be “bow-tie” shaped (DSBT-92). These two – or is it three or four? – “bow-tie” shaped fragments are conclusive as far as the DSB is concerned: their assertion that it was a Buk warhead type 9N314M completely depends on these two or three or four fragments. John Helmer has argued that there is a suspicious amount of secrecy and national security about these vital pieces. This is a point of contention with Almaz-Antey’s reports which maintain that the Buk used did not have a “bow-tie” warhead. AA2, which used a static test of a Buk with “bow-tie” (Almaz-Antey calls them “I-beam”) shaped particles in its warhead, argues that the resulting destruction pattern shows bow-tie/I-beam shaped holes (AA2-27) (which DSBT does not) and many more bow-tie/I-beam fragments – there are more than 2000 in that particular warhead design – in the wreckage than two or four. From this Almaz-Antey concludes that the warhead used was not the 9N314M (which has bow-ties/I-beams) but the B9N314 which does not. Their point is that this is the type of Buk in Ukrainian service but no longer in Russian service. DSBT-144 gives the estimated launch point for the Buk. It chooses a rather large area to the east of Torez more-or-less in front of MH17. In that area is a smaller one it claims to have been provided by Almaz-Antey and a still smaller one provided by the Kiev authorities. Therefore a missile fired from any of these positions would have been approximately head-on to MH17 (from directly head-on to about 30°). This is one thing to which I will return, but I must say I do not understand what the DSB is talking about when it includes an Almaz-Antey estimate of the launch point in this area: neither Almaz-Antey presentation gives an origin in that area. As we saw above, Almaz-Antey gives an estimated firing point that would place the missile launch point much more to the right of MH17 – at roughly 60° from its course. Which brings us back to the key point: ignoring the damage to the port wing and port engine allows the DSB to make the missile track more to the front of MH17’s course. Such an origin is impossible if the damage to the wing and engine are taken into account. The DSB report elides the issue altogether but does provide an “out” by showing a photo of the engine damage. There are a number of questions that can be raised about the report: the lack of primary radar data from Ukraine and NATO is just not believable and the authors should not have blandly accepted it: there were Ukrainian fighters in the air and no one should possibly believe that NATO assets weren’t watching the area. The report airily ignores the Russian MoD claim of a fighter plane near MH17 (although leaves itself an out by saying the Ukrainian data showed nothing). The “flight route question” is completely unaddressed. Too much hangs on the very small number of bow-tie/I-beam pieces. 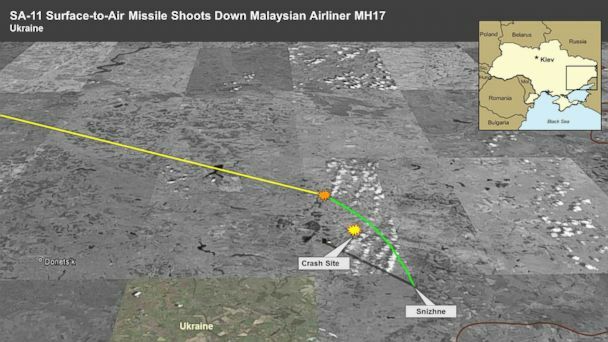 By the main thing is that, because it has ignored the damage to the port wing and port engine (although leaving a photo of the latter in the report so as to provide an out), it is able to shift the approach line of the missile away from Kiev-held territory to the south of MH17’s route to rebel-held territory in the south-east. I agree that we will probably not know until the regime in Kiev collapses or some Edward Snowden reveals something. (Although, as it now appears that the Kiev regime is actually questioning the official “heavenly hundred” sniper story, discussed here by Gordon Hahn, who can say what’s next?). I would suggest the following possibilities. The Kiev forces deployed Buks because they had convinced themselves that Russian aircraft were shooting their aircraft down (DSBT-183). Or, while practising they shot it down by accident. It was shot down on purpose so as to create an atrocity that could be blamed on Russia. It should be recalled that the USA in 1962 did seriously entertain a scheme to shoot down a passenger plane and blame it on Castro. (“It is possible to create an incident which will demonstrate convincingly that a Cuban aircraft has attacked and shot down a chartered civil airliner…” Admittedly, the plan called for no passengers to be killed). I would draw the reader’s attention to the media coverage. A media campaign blaming the rebels and Russia began almost immediately after the crash; on the other hand, the media has been very silent about the DSB report. The Daily Mail can serve as an example of both: “Anything to confess, Putin? Russian president in church as world leaders warn him you can’t ‘wash your hands’ of MH17 disaster” 18 July 2014 (“Amid growing evidence that the flight was hit by a sophisticated surface-to-air missile, launched from areas controlled by pro-Russian rebels in the separatist eastern regions of Ukraine, fingers have increasingly been pointed at Russian president Vladimir Putin, who denies involvement.”) and “Russian missile killed pilots and cut jet in half but passengers could have been conscious for up to a minute as plane plunged, reveals official report into MH17 downed over Ukraine” 17 October 2015 (rather neutral coverage full of “he said, she said”). And the story seems to have disappeared. A cynic might be excused for wondering if some central agency puts out the story line. I find this suggestive. As for further developments I recommend Alexander Mercouris’ piece on RI – there are some legal cases coming up that may prove interesting. I also recommend John Helmer’s writings on the subject at his blog Dances with Bears. The story appears to be unravelling in several places at once. He also goes into more details on the tiny number of bow-tie/I-beams on which the DSB hangs so much of its case. Stay tuned, there may be more to come. An Australian MSM outlet known as news.com.au has published a video and transcript with the breathless title of “Full transcript: Russian-backed rebels ransack the wreckage of MH17 in shocking 17-minute video”. The sub-title is :”For 17 minutes, they ransacked the luggage of innocent people who had just been shot out of the sky. The full transcript of the never-before-seen footage reveals what they were looking for.” We are helped to the correct feelings with comments like: “No respect … Rebels taking what they want ” “Disgusting … A rebel going through the bag of a victim”. Here it is: see for yourself. So, this news outlet thought it had a scoop that would further cement the Accepted Western Story about MH17 and put more all-round blame on the rebels in eastern Ukraine. The problem with living in the bubble is that you don’t know that you are inside the bubble. You do not understand that 1) there is no evidence worthy of the name that the rebels or the Russians shot MH17 down and 2) that your job is to manufacture more fake evidence. What being in the bubble really means is that you are so far inside the bubble, that everybody you talk to is in the bubble with you, that everything you read or see is selected for the bubble-view that the bubble-view becomes the only view. And you come to believe that there’s no one outside the bubble except conspiracy theorists and Putin trolls. The walls of the bubble are thick and impenetrable. So you do not know what a “Sukhoi” is because you’ve never seen the evidence that a Ukrainian Sukhoi-27 shot MH-17 down. So you have no idea when you rush to publish another smear job that what you have actually done is add another piece of evidence to the Sukhoi shoot down theory. The suppressed (but not suppressed enough) BBC report of eyewitnesses. The witness of the Ukrainian air force technician. Not necessarily on order from Kiev, by the way. A report arguing an air-to-air missile destroyed it. And, thank you news.com.au, now there is your evidence. Read these excerpts from the transcript. These people are not looting; they are trying to figure out which bits are from MH-17 and which from the Sukhoi fighter they shot down. They are going through the wreckage trying to understand what they have here. They say the Sukhoi (Fighter) brought down the civilian plane and ours brought down the fighter.